On the September 9th 2014’s Concreteweb-update we included the Pagan Assault-review for the Révolte Contre La Destinée-album. Pagan Assault is a solo-outfit by Frenchman KFD, the same guy who runs Soleil Blanc Productions, and the same guy behind Anthropophobe. The latter is a largely underestimated project that released a first album in 2012, which was called Le Royaume Des Morts (‘kingdom of the dead’). 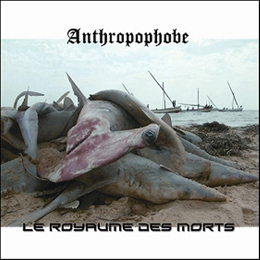 Le Royaume Des Morts was written, recorded, engineered and produced by KFD in between 2003 and 2012. The lyrics are in both English and French, and the lay-out, also done by KFD, consists of pictures of sharks; little weird and confusing, but pretty surprising and renewing. It was the first release on Soleil Blanc, by the way. The album itself, a ten-tracker, has duration of forty one minutes. And it is quite different from Pagan Assault. Le Royaume des Morts opens with Introspection, which starts with an eerie, sorrowful introduction. After a couple minutes, this opening track transforms in a slow-paced, raw (instrumental) Black piece with repetitive riffs, grimly executed melodies and a slowly-pounding rhythm section. It does give a fine-stipulated idea of what Anthropophobe have to offer with this debut album. Le Royaume Des Morts brings utterly grim, primitive and uncompromising old styled Black Metal. No trends, no gimmicks; this material is raw, unpolished, but most of all: pure. It’s a traditional interpretation of the Old School. Besides for the performance / song writing, this goes for the sound as well. The production is dry and anti-clinical; I like it, of course, but it might be little too under-produced. That for sure was meant to be this way, yet still it will repel a certain audience - but that’s their problem; I think it is the most fitting way to express this sonic evilness. The tracks are pretty diversified too, with a wide scala on structures and melodies, tempos and rhythms, including dissonant leads and contrasting melodies, and hints of Teutonic Black-Thrash. A couple of parts are slightly different, like the instrumental song (Ils Arrivent) (‘they are coming’), which is quite mayhemic (got it? …and when I add ‘Silvester Anfang’?... Aha, there you have it). Also a track like the epic title song is rather special, with those hypnotic keyboard lines (they return again in hymns like the burzumesque song Cry Of The Lonewolf, for example), the prominent bass lines and the wretched semi-spoken vocals. And what to think about the noisy intermezzo at the end of the album? I’m sure that if you like stuff à la earlier Burzum and Darkthrone, Wrong, Mortualia, Moon etc., then you will adore this ten-track album for sure.